The best lower-body exercise can also be one of the most dangerous. 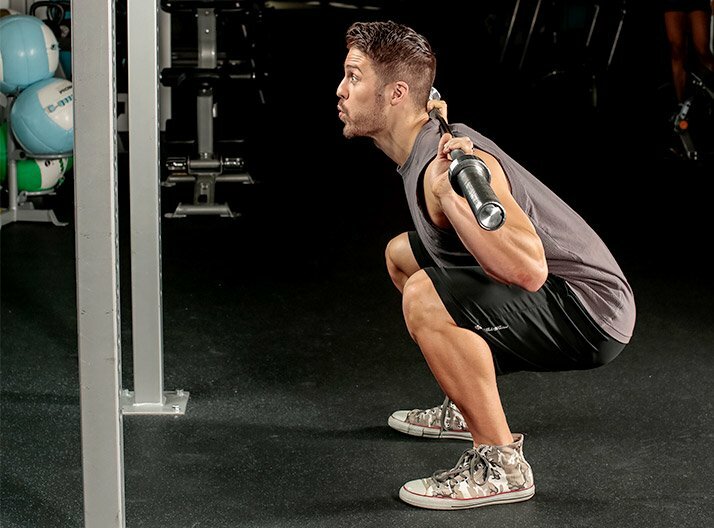 See if you're committing any one of these key mistakes when squatting. For decades, bodybuilders have known that squatting is the single best lower-body exercise. Besides involving the glutes and all of the front and rear thigh musculature—not to mention the calves—the squat allows you to push a substantial amount of weight. The squat can be tricky to master, though, and poor technique on this lift has generated a lot of business for chiropractors and orthopedic surgeons over the years. See if you're making one of these crucial errors. For knee-joint health, your knees shouldn't pass over an imaginary line that comes straight up from your toes. If they do, try sitting back more into the squat and work on your flexibility. Additionally, avoid squatting on plates or heel boards, which push your knees forward. If you're using a leg-press or hack-squat machine, the same thinking applies, but the line will be coming up from the foot plate. Here, place your feet higher on the foot plate, which will take some of the emphasis off the quads and knees. For knee-joint health, your knees shouldn't pass over an imaginary line that comes straight up from your toes. 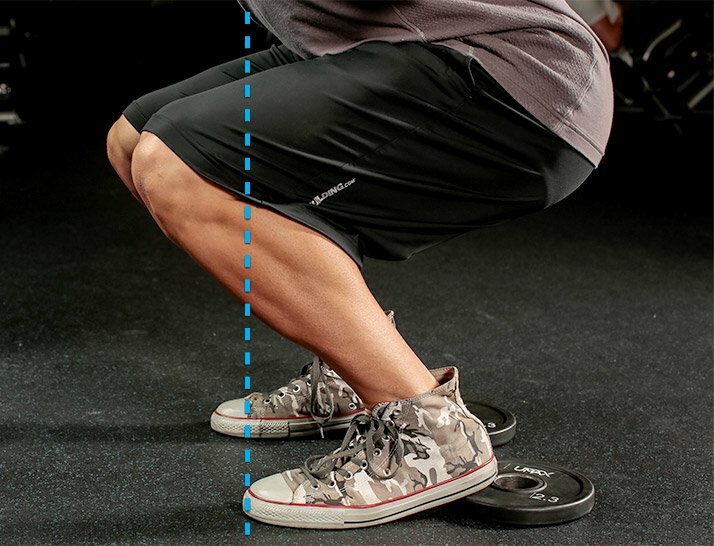 For maximal thigh development, you want to squat as low as you can—at least to a point at which your thighs are parallel to the floor with about a 90-degree knee bend. The deeper you go, the more your glutes and hamstrings have to work. Very shallow squats mean you're shortchanging the range of motion, akin to doing partial reps, so don't expect maximal leg development. Too many trainees forget to check their ego at the door, loading up the bar with weight but squatting down only a few inches. 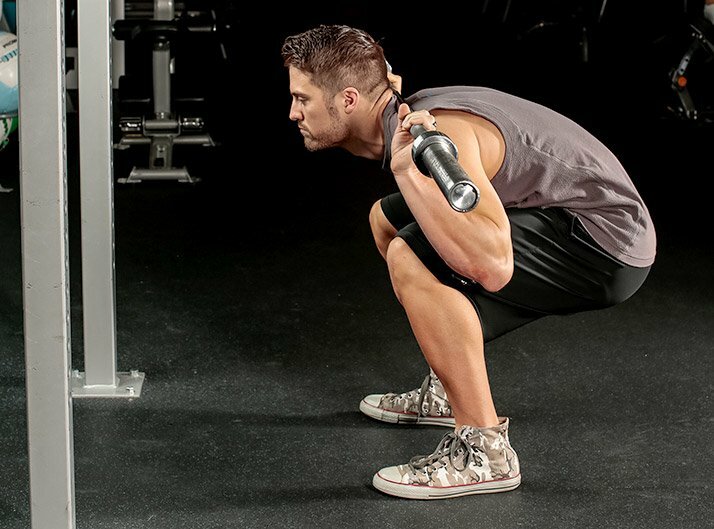 This rule applies to any kind of squatting motion, including hack squats and leg presses. Very shallow squats mean you're shortchanging the range of motion, akin to doing partial reps, so don't expect maximal leg development. One of the most challenging aspects in the beginning is keeping a flat back, especially with a weighted bar loaded atop your spine. But rounding your back is dangerous because it places undo stress on the intervertebral discs, which act as shock absorbers and are highly susceptible to injury. Lock your spine in a slightly arched position and hold it there. It helps if you maintain a big chest and pull your elbows back as you complete the movement. Rounding your back is dangerous because it places undo stress on the intervertebral discs. Where to look, where to look? Some "experts" say look up, advocating turning your head up; which is supposedly safer for your spine. But that actually curves the cervical portion of the spine, and you may be carrying hundreds of pounds across your upper back—another risk factor for disc injury. The truth is that you want to maintain a neutral arch in your cervical spine, not just your lower back. That means looking directly forward. If you can see yourself in the mirror, your head position is spot-on. Keep your head in that position for the duration of the set. Looking way up actually curves the cervical portion of the spine, and you may be carrying hundreds of pounds across your upper back—another risk factor for disc injury. Most lifters think "breathe out" as they lift a weight, but here especially is a case in which you want to hold your breath until you reach a point near the top of the movement, just past the sticking point. Reason being, holding your breath will increase the intra-abdominal pressure, actually making you stronger as you push up and helping to prevent lower back injury. Exhale forcefully near the top of the rep.
You want to hold your breath until you reach a point near the top of the movement.